Dermaplaning is a safe, non-invasive exfoliating treatment which removes several layers of dead skin cells as well as the fluffy blonde facial hair (vellus hair) that annoys so many of us! Dermaplane can be had as a stand alone treatment- perfect before an event to give you bright, glowy skin – or prior to other skincare treatments (such as peels, LED Dermalux, skin-needling) to achieve even better results. The results are immediate with no downtime. All makeup is removed with a gentle double cleanse. The skin is then cleaned of any surface oil with a skin preparation solution. The practitioner then gently moves the blade at a 45 degree angle back and forth over small sections of skin a number of times. The practitioner will move onto a new section until the whole face is treated. After removing surface dead skin layers with the blade, a gentle enzymatic peel is massaged onto the skin to loosen any remnants of debris. This can feel a little tingly but is not uncomfortable or unpleasant. No, not at all. You could easily fall asleep whilst having this treatment. Will the hair grow back thicker or darker? No, this is physiologically impossible. There are two types of hair that grow on your body. When cut or removed vellus hair, which is the fine hair on the face we are removing, will grow back at the same rate and texture as before the treatment. How often should I have / can I have a Dermaplane treatment? You can have this as often as every 4 weeks. It is a good routine to get into having four weekly treatments so that as the skin completes its’ cycle with a new layer of dead, scaly keratinocytes reaching the outer layer you are booked for your next session. Do I need special preparation before Dermaplane? No special preparation is required however it is important to discuss your expectations with your practitioner before starting treatment. It is also imperative that you disclose any treatments you have already received, any medications you are taking and any medical history you have. What are the risks and potential complications from Dermaplane? As the procedure involves the use of a sharp blade, there is the potential for causing small nicks or cuts to the skin. Can anyone have a Dermaplane treatment? This treatment is not recommended for anyone on blood thinning medication; with a history of bleeding disorders; with active acne; diabetes; cancer; psoriasis or eczema. If you are fit and well and in good health, however, this is a treatment option for you. Does Dermaplane help with getting rid of my spots? Dermaplane can help with the overall appearance and health of the skin by removing surface dead skin cells that contribute to clogging and blocking pores causing comedones (black and white heads). By exfoliating the skin, skincare products and treatments are able to penetrate more deeply and are therefore more effective. 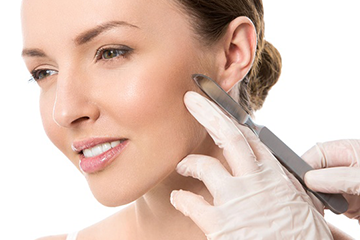 Dermaplaning uses a sterile medical blade to gently scrape away the superficial layers of dead skin cells. The benefits are much smoother skin – makeup will go on like never before and look flawless; removal of soft facial hair that traps dirt and oil in turn promoting better skin health. Skincare products or other treatments are more effective as products are able to penetrate the skin more deeply.